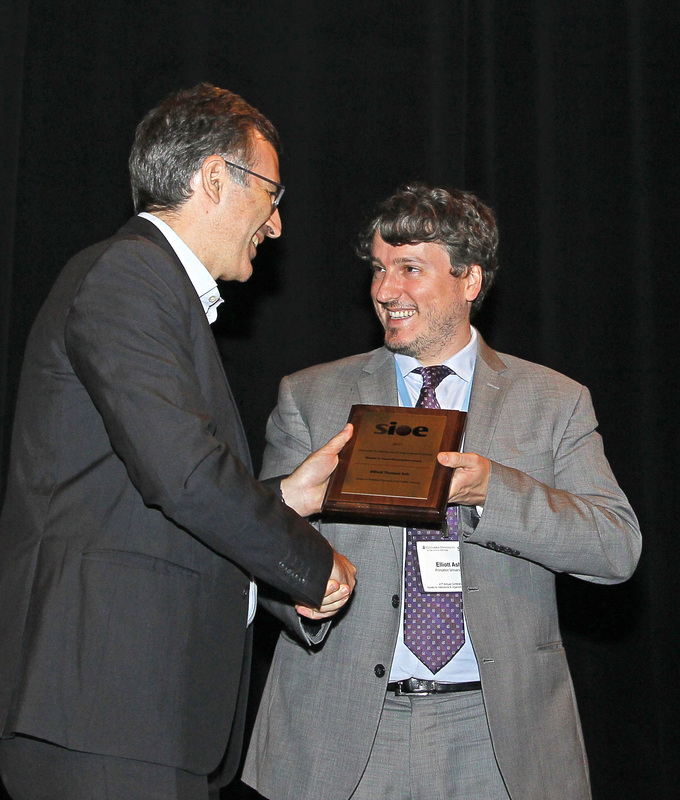 Elliott Ash receiving the Best Dissertation Award from SIOE President Sergei Guriev. Three faculty members were selected to be the finalists for the 2017 Ronald Coase Best Dissertation Award. They are Elliott Ash (Assistant professor of economics, the University of Warwick: "Essays in political economy and public finance"), David Szakonyi (Assistant professor of political science, George Washington University: "Renting Elected Office: Why Businesspeople Become Politicians in Russia"), and Alan Zarychta (Assistant professor of Social Service Administration, University of Chicago: "It Takes More than a Village: Governance & Public Services in Developing Countries"). The award committee agreed that the dissertations of all three finalists were of very high quality and were a pleasure to read – interesting and important research questions, great attention to relevant institutional details informing both the theoretical argumentation and the empirical design, careful attention to identification issues, and strong implications for research and practice. The winner was Elliott Ash. The committee applauded Professor Ash’s dissertation for its ambitious scope and its methodological novelty (and rigor). Regarding scientific merit, each of the three essays in Professor Ash’s dissertation delved deep into the theoretical mechanisms that affected how legal and/or political institutions functioned. The findings indeed generated truly novel insights, e.g., that merit-based rather than partisan-based selection of judges generated higher quality judgements made by the judges; that greater complication of tax codes enabled the implementation of more redistributive fiscal policies; that property tax increases (due to unexpected reassessment) led to better local economic performance by way of government spending but not local residents' increased borrowing. The methodologies were rigorous, and in particular the sophisticated use of natural language processing tools had much potential to advance research in social sciences. Regarding the broader impact, all three essays in Professor Ash's dissertation were timely as they directly addressed current debates and confusion in public policy arena. The Ronald Coase Best Dissertation Award is awarded every year. To be eligible, the PhD would have to be awarded in the previous two calendar years. Please watch out for the call for nominations for the 2018 Ronald Coase Best Dissertation Award to be released in Spring 2018!